Will I ever have my mini-heads?! They look pitiful. It was my fault I planted them late. 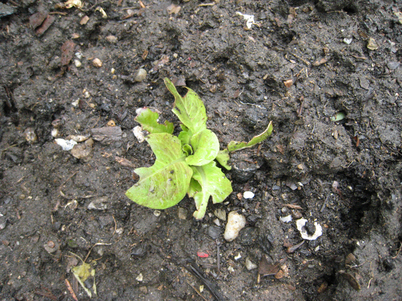 They germinated, but right away something chomped them – slugs? I don't know. Now it's getting hot and until I weeded on Sunday they had lots of competition. Caro- hey, you might want to try Sluggo. I rarely if ever use any treatments in my garden, and if I do its organic. But this year I had a massive outbreak of slugs due to the rain. Sluggo is basically iron phosphate, so its non-toxic and can be used in the veggie garden (safe for pets, etc. decomposed in the garden) I haven't used much and its been very effective. Come on, mini-heads! 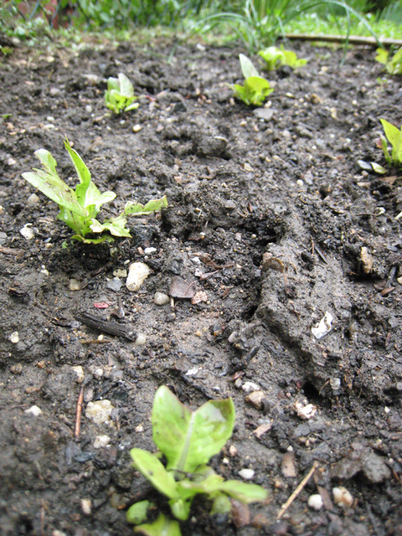 I want to see tiny baby lettuces. Seems like they wouldn't need to do MUCH to make just a baby head... I'm rooting for them.